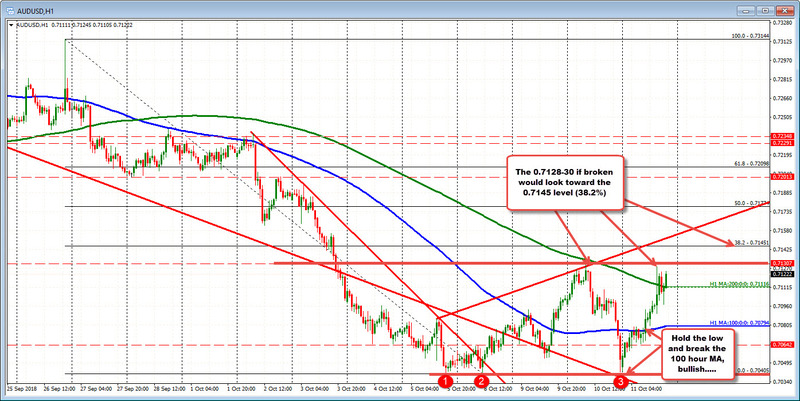 The AUDUSD is one of the stronger currencies today (along with the NZD). That strength has happened even though stock markets have been really nervous today. The 200 hour MA has also been broken but the last 4-hour has seen the price trade above and below that MA line (green line currently at 0.71116). The pair is currently looking to tests the high for the day at 0.7128. That low was just below the high from yesterday at 0.7130. A move above each will be a signal for higher levels with the 38.2% at 0.7145 (from the Sept 26 high). A move back below the 200 hour MA may be the last straw for the bulls today. In which case, we would look back toward the 100 hour MA at 0.7079 (blue line in the chart above). He is on pace to become the highest earner in Jeopardy! history. Who is James Holzhauer. USD/CNY mid rate today 6.7035. Also, FX options for Monday expiry of note. All the biggest trading floors in the world have screens locked on ForexLive™. We provide real-time forex news and analysis at the highest level while making it accessible for less-experienced traders. Looking for our RSS feed? Founded in 2008, ForexLive.com is the premier forex trading news site offering interesting commentary, opinion and analysis for true FX trading professionals. Get the latest breaking foreign exchange trade news and current updates from active traders daily. ForexLive.com blog posts feature leading edge technical analysis charting tips, forex analysis, and currency pair trading tutorials. Find out how to take advantage of swings in global foreign exchange markets and see our real-time forex news analysis and reactions to central bank news, economic indicators and world events.